Last year brought the craft beer world some things we loved, and some things we hated (we’re looking at you, milkshake IPAs). The haze craze, sours spiking in popularity, and the pastry stout all dominated 2018 beer menus. But in 2019, will things change, or will they remain the same? We asked some local brewmasters for their predictions for the coming 12 months. Perhaps the biggest Bay Area beer trend of last year was the brut IPA, allegedly birthed in San Francisco by Social Brewing’s Kim Sturdavant. This light-bodied, dry IPA is created with the addition of an amylase enzyme, typically used to create a lighter body in heavier beers, such as stouts and porters. The result is a very drinkable, champagne-like beer with almost no bitterness and a higher carbonation. It provides a refreshing alternative to the heaviness of hazy IPAs as well as the biting flavor of extra-hoppy IPAs. San Leandro’s Drake’s Brewing Company has embraced brut IPAs from the beginning. 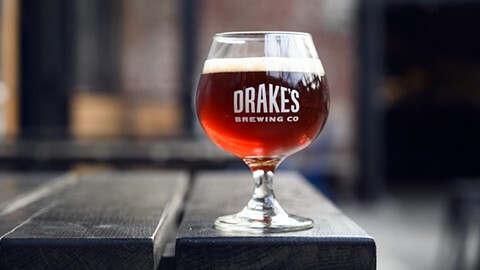 Brian Stechschulte, director of marketing at Drake’s, said Drake’s was one of the first breweries to put a brut in a six-pack. “We certainly didn’t originate the style, but I would say we helped pioneer it in the sense of experimenting,” Stechschulte said. Beer sommeliers are conflicted on whether the brut IPA is a passing fad or if it has staying power, but our guess is you’re not quite done seeing them in 2019. A lager is a beer brewed at lower temperature to produce a crisp, simple flavor — one popular type of lager is the pilsner. One reason the “year of the lager” has taken so long to come to fruition is that it’s one of the most difficult styles of beer to brew. “It takes twice as long, and the ingredients are expensive, too,” explained Jim Woods, founder of San Francisco brewing company Woods Beer Co., which has a brewery and bar location in Oakland. And part of it, too, is that lagers might be perceived as boring by some more adventurous types. But these beers are about to get a lot more creative and flavorful. Gilbert said Temescal Brewing has been doing heavy experimentation with lager and plans to brew a lot of it in the coming year. “My hope is that doing it really, really well shows people that drinking simple beer doesn’t mean drinking mass market canned industrial lager,” Gilbert said. For our wine-loving friends, beer is about to make the biggest genre-bending crossover of all time. Brewers are taking notes from winemaking practices to create hybrid beer-wines. This idea isn’t exactly new — people have been making beer-wines as far back as the 1970s — but some of the processes they’re using are. Woods Beer Co. is debuting its first natural wine (wine made with minimal chemical and technological intervention) line at this year’s SF Beer Week, along with its Divine Origins series, a spontaneously fermented beer and wine project. To make the hybrid, Woods spontaneously ferment beer in the same process one would use to make natural wine. No one’s sweet tooth is going away anytime soon, but with milkshake IPAs and pastry stouts saturating every menu for the past year, it might be time to take a breather. Ask any brewer: Lactose is getting stale. “I am less inclined to use lactose now that it’s so widespread. I personally think that it’s kind of a novelty. I don’t know how much staying power it has,” Woods said. Another approach to balancing out the sweetness is pairing lactose with sour beers, achieving the perfect contrast of tart and sweet. Berkeley’s Fieldwork Brewing Company brews a “parfait” series, including the “Blackberry Parfait,” a sour ale brewed with blackberries, lactose, and vanilla. West Oakland’s Ghost Town Brewing also recently added a piña colada-inspired sour with pineapple, lactose, and coconut to its menu. The result is a pillowy, creamy finish that’s a pleasant change from the sometimes mouth-puckering intensity of a sour. However, “I’ve seen a little bit more of a vegan backlash to lactose beer,” Gilbert said. If brewers want vegan drinkers on their side, the next big thing might just have to be inventing the fermentable vegan lactose alternative.